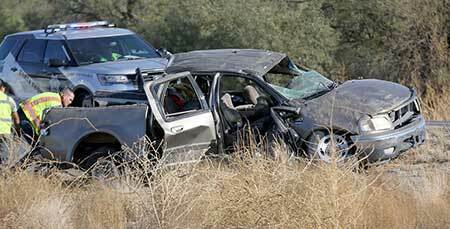 Tucson, Arizona—A rollover accident on northbound Interstate 19 near the San Xavier Road exit killed Maria Concepcion Gable, age 49, and Marco Valles, age 14. The other occupants of their vehicle were taken to a Tucson hospital for treatment. Arizona Department of Public Safety accident investigators determined that tire failure caused Ms. Gable to lose control of the pickup truck. All passengers were transported to Banner University Medical Center where three youths were treated and released. It is believed that all the occupants in the pickup truck were residents of Tucson. We extend our condolences to the Gable and Valles families and friends for their tragic loss. We wish those who were injured swift and full recoveries. A rollover accident on I-19 near the San Xavier Road exit killed Maria Concepcion and Marco Valles. Accident investigators are blaming the rollover on tire failure. Rebecca Mayers was killed on Monday afternoon as a result of a three-vehicle accident on U.S. 93 north of Dolan Springs. DPS investigators believe tire failure may have been a cause of the crash. Donna Howard died from injuries she received when a tire of the bus she was driving failed, causing the bus to roll onto its side and partially ejecting her from the bus.